You are currently browsing the tag archive for the ‘nathaniel hawthorne’ tag. “I shall not touch it, I assure you,” said she. 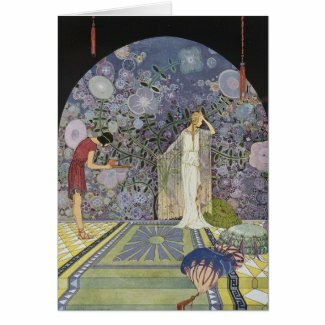 Thus runs the quote for this illustration by the American artist Virginia Frances Sterrett that depicts the goddess Proserpina in Pluto’s palace rejecting his offer of pomegranate seeds. The illustration was one of several undertaken by Sterrett for Nathaniel Hawthorne’s adaptation of six Greek myths. These were published by the Penn Publishing Company in 1921 as Tanglewood Tales. The Pomegranate Seeds recounts the tale of Roman goddess Proserpina, or Persephone in Greece, and how she ultimately succumbs, thus creating seasonal changes. Like all myths, there are various versions. If you want to find out more, click here. To read about the life of Virginia Frances Sterrett, who had barely reached her 30s before tuberculosis cut her down, click here. The image comes from the Old Book Art Gallery, a source of vintage public domain images I came across recently that is chock-full of delights.